The flow between shapes is represented by connectors, for example, a sequence message between two lifelines of Student and StudentControllerwhich represents the call from Student to StudentController. If the flow is created mistakenly or the flows need reverting due to an updated data, the flows can be fixed by reverting connectors. The function of reverse connector is not only for reverting the connector’s direction but also for repositioning the information contained by the end of connection. For connectors like association, each end contains specific information like multiplicity, role name, visibility, etc. Reverting connector will also swap the information. Right click on the connector between two shapes and select Reverse Connector from the pop-up menu. As a result, the flow of connector is reversed. 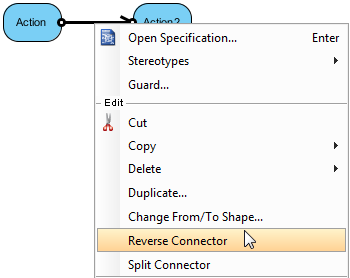 Note: Connectors, such as create message in sequence diagram, are not reversible.